Instagram Stories are the hottest content type on the platform. It’s promoted by Instagram, it gets better reach and people love it, even though it’s very ephemeral type (Stories disappear after 24 hours). But did you know that you can analyze their performance? If you have a personal account on Instagram, you can only see who saw your Story. You get more data, when you switch to a Business Profile. After that you get an access to Instagram statistics from the app itself. It’s not very convenient – if you want to do a comparative analysis, analyze your performance in a longer period of time, see which Stories performed the best, it would be tedious and tiresome. Did you know that there are special tools designed to help you understand the Instagram stats and show them in one place in an comfortable way? 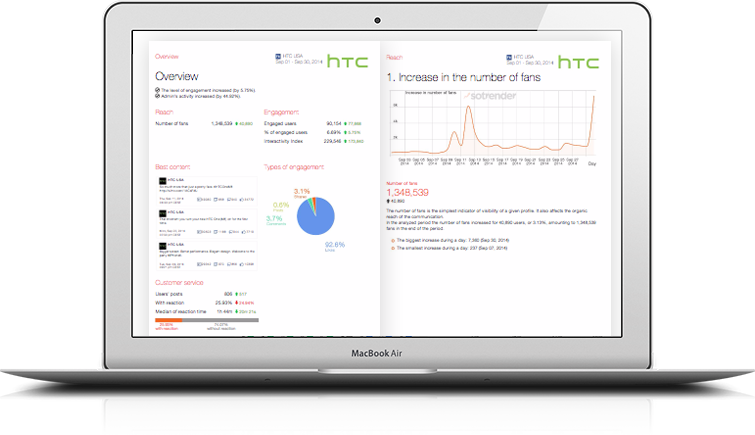 Sotrender is a social media analytics tool with developed Instagram analytics. You can analyze your performance, followers (not only their demographics, but also when they are online, their actions on Instagram), content and even benchmark with and follow your competitors. Cool, right? All you have to do is to have an Instagram Business Account (you can learn how to convert your personal profile into Business Account here) and create account in Sotrender here. After that you get an access to all the data you need to analyze your performance and become social media king and your brand benchmark for others. That’s not all. You can analyze Stories in Sotrender, too. Knowing that data, you can decide what Stories were the most engaging for your followers, which caused the highest number of reactions and which Stories your followers didn’t like. And knowing all that, you can improve your Stories, make them as engaging as ever. But you know, analysing Instagram Stories is important, but you should also analyse performance of your posts, too. The most basic (but still incredibly important) indicator of effectiveness of your performance is reach. It shows how many users saw your content. If someone saw your content more than once, they still count as 1 in this metric. 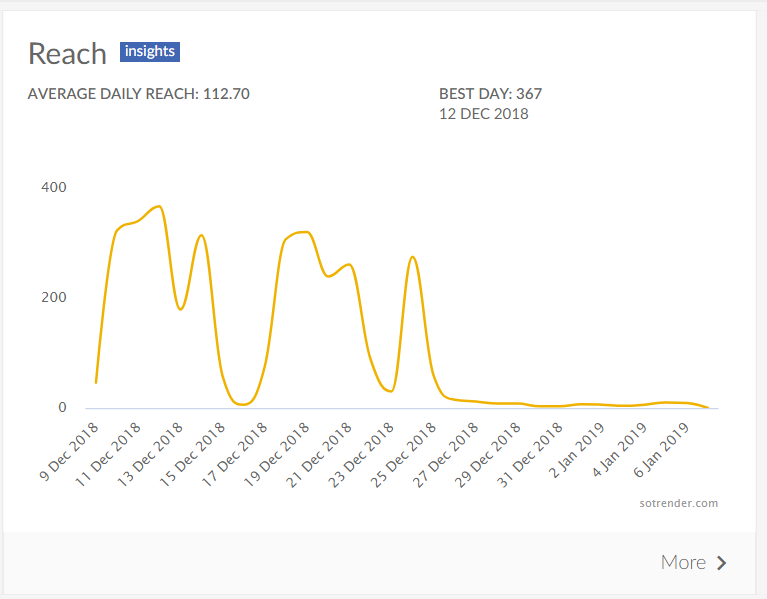 Sotrender offers you a deeper Instagram reach analysis – you can also check, which day of the week is the most effective for you to post. Metric quite similar to Reach is Impressions. It indicates how many times your content was seen on social media. One user can view your content more than once and each it appears in their content counts. That’s why Reach can never be higher than Impressions. Just like with Reach, you get a deeper analysis of Instagram Impressions. 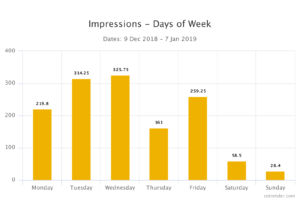 We break down our impressions over days of the week, so you can see, when to post, but that’s not all. You can also analyse how many Impressions different kinds of post – photos, videos and carousel – had. It can help you in deciding what is most engaging for your audience. A good social media marketing specialist knows everything about their brand’s audience. 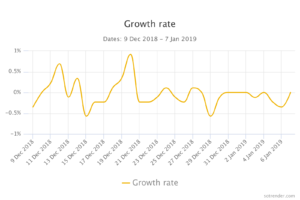 In Sotrender you can analyze its number – that’s obvious – its growth and growth rate. 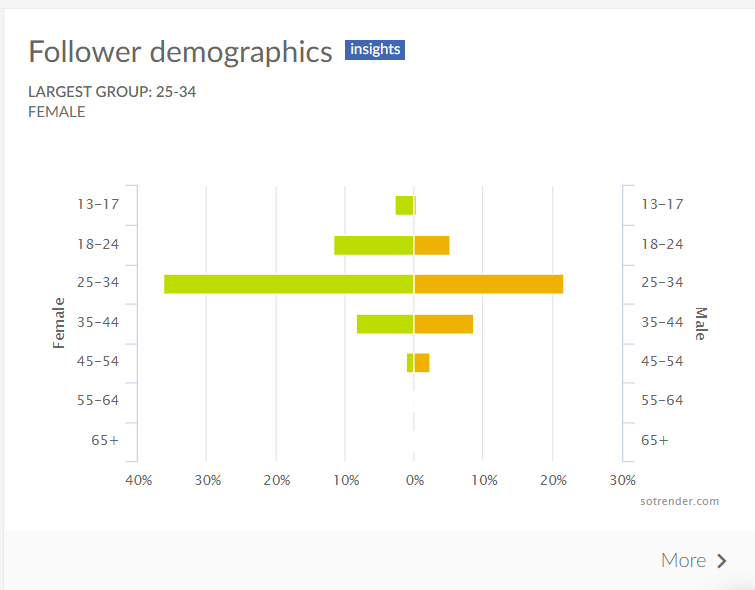 We offer you also a deeper analysis of their demographic data – gender, location (country and city) language they use on Instagram. All this data gives you knowledge how to communicate with them. How can my business use Instagram Stories?